Nathan’s insight today is so valuable because he himself works in the corporate world. After graduating from university and getting a job at a web-hosting company, he realized designing websites was a very lucrative niche for him. With his first clients, he didn’t know what to charge. He was saying yes to everyone. Clients were seeing him as someone who gave high-quality work at cheap prices, and Nathan was ready for a change. I need to find clients that will pay me more and also recognize the level of value that I’m bringing to the table. Nathan set his sights on corporate clients but had no idea how to meet them. So he took a job at a local company in order to see what went into the pitch and hire process for corporate freelancers. What he learned surprised him. I thought it was a little more straightforward. If you were good enough and produce results, they would just select you. But there are a lot of nuances in there about how [corporate clients] went about selecting. In order to stand out for corporate clients, Nathan recommends asserting yourself as an authority. Writing and blogging are great places to start, but podcasts and videos can be more interactive. 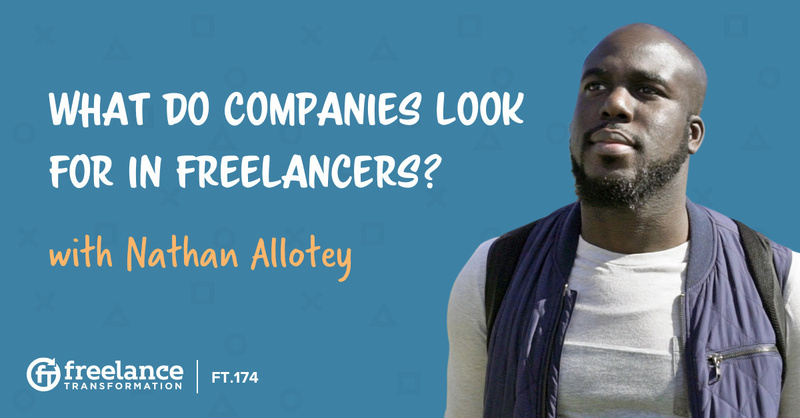 Nathan uses YouTube videos to teach other freelancers, a side gig that built his confidence and ultimately inspired him to chase down those quarter-million corporate clients. It is important to remember that many corporate clients shop for freelancers from an approved vendor list. If you want corporate clients, it’s important to be on that list. Nathan shares tips for ways to work with a corporation’s legal department in order to get yourself on that list. In how you present yourself, always show that you have strategy built in there. Corporate clients look for specific things from freelancers, and it goes well beyond just your skill set. Working for a corporate client means understanding their vision and their bottom line. If you can show how your work can build their brand, drive traffic to their site, or increase conversion rates, you will be more likely to keep their attention. Corporate clients are more interested in strategic analysis than they are in creativity and development. If you want to think more strategically, what else can you add that speaks to the fact what you produce actually works and increases the bottom line? I like to think of strategy as the connection between a company’s vision and the specific tactics of what they do. Nathan doesn’t want you to leave your creativity by the wayside. Instead, show that what you create speaks to the corporate client’s vision. What can you add to your portfolio that shows off some of your strategic skills? Nathan shares ways you can reach out to corporate clients to show off your strategy without stepping on anyone’s toes. Winning over a corporate client is all about strategy, but it requires something else too. It’s what Nathan calls “the human element”. If you’re reaching out to corporations online, you want to be more than just an email. Always find ways to connect and show that you really care about the work you do and the clients you work with. Priced projects are Nathan’s way of giving corporate clients a taste of what it’s like to work with a freelancer. If you can sell a small piece of your skills as a productized project and give a potential client a chance to see what you can do, they are more likely to call on you in the future. Think of it as a sneak peek. The client gets to work with you as a human and you get to show off your skills. This technique helped Nathan build his corporate portfolio, and it could help add a few corporate clients to your own.